When the Munich Agreement was signed on 29 September 1938, Britain and France agreed to Hitler’s demand to be given the German speaking border regions of Czechoslovakia, and the Germans marched in. The Jews from about sixty congregations in the prosperous industrial and commercial towns in the Sudetenland had 2 or 3 days to flee to the interior, which was still a free and sovereign country. They left behind their synagogues, which were in German hands in time for the destruction of the Pogrom of November 1938, when synagogues across the expanded Germany, which now included the Sudetenland, were burned or vandalised and looted. In almost every case the ritual treasures of these Sudetenland synagogues were destroyed or lost. In the remainder of Czechoslovakia, which included Prague, the synagogues and their swollen congregations were safe for the time being, and there was no programme of destruction, even when the Germans invaded the rest of the country in March 1939. In 1940, the congregations were closed down, but the Jewish community administration was used by the Germans to execute their stream of decrees and instructions. In 1941 the first deportations started and the mass deportations of the Jews took place throughout 1942 and into January 1943. The Nazis decided to liquidate the communal and private Jewish property in the towns, including the contents of the synagogues. In 1942 Dr Stein of the Juedische Kultusgemeinde in Prague wrote to all Jewish communities, instructing them to send the contents of their synagogues to the Jewish Museum in Prague. Thus the Torah Scrolls, gold and silver and ritual textiles were sent, along with thousands of books. The remaining Jews were deported in 1943 and 1944, but quite a number survived. The inventory of the Prague Jewish Museum expanded by fourteen times as a result, and a large number of Jews were put to work by the Germans to sort, catalogue and put into storage all the items that had come from over one hundred congregations in Bohemia and Moravia. It needed over forty warehouses, many of them deserted Prague synagogues, to store all these treasures. When the task was eventually completed, the Jews who had been put to this work were themselves deported to the Terezin concentration camp and death. There were few survivors. In 1958 the 18th century Michle Synagogue became the warehouse which housed hundreds of Torah Scrolls from the large Prague Jewish community and what was left from the smaller communities of Bohemia and Moravia. The collection did not include scrolls from Slovakia, which the Germans had put under a separate administration. On his return to London, he contacted Ralph Yablon, a well-known philanthropist with a great interest in Jewish art, history and culture. Yablon became the benefactor who put up the money to buy the Scrolls. First, Chimen Abramsky, who was to become Professor of Hebrew Studies at the University of London, was asked to go to Prague for twelve days in November 1963 to examine the Scrolls and to report on their authenticity and condition. On his return to London, it was decided that Estorick should go to Prague and negotiate a deal, which he did. 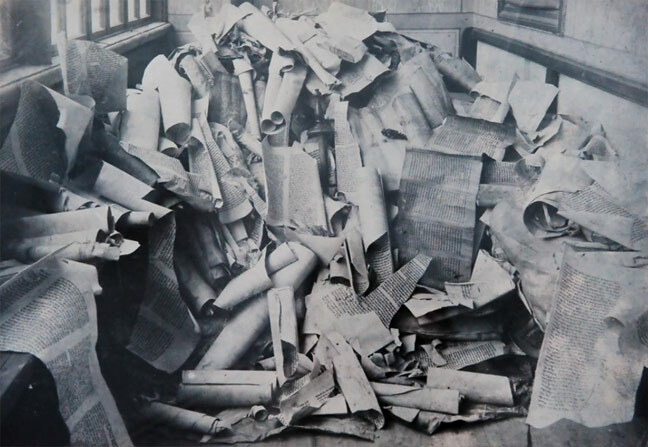 Two lorries laden with 1564 Scrolls arrived at the Westminster Synagogue on 7 February 1964.